Clem is receiving email at clesch@pclbonds.com and taking calls from friends at 214-212-9419. His home address is 418 CR 204, Valley View, TX 76272. 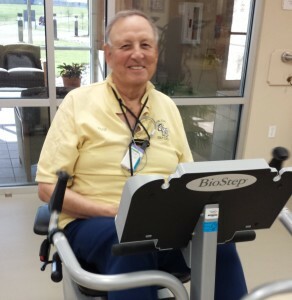 During the week Clem completed his first week of cardiac rehab. 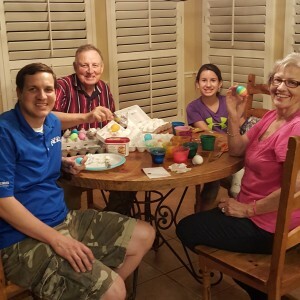 Then over the weekend Clem and Pauline celebrated Easter by making colored eggs at Eric and Melissa’s house. 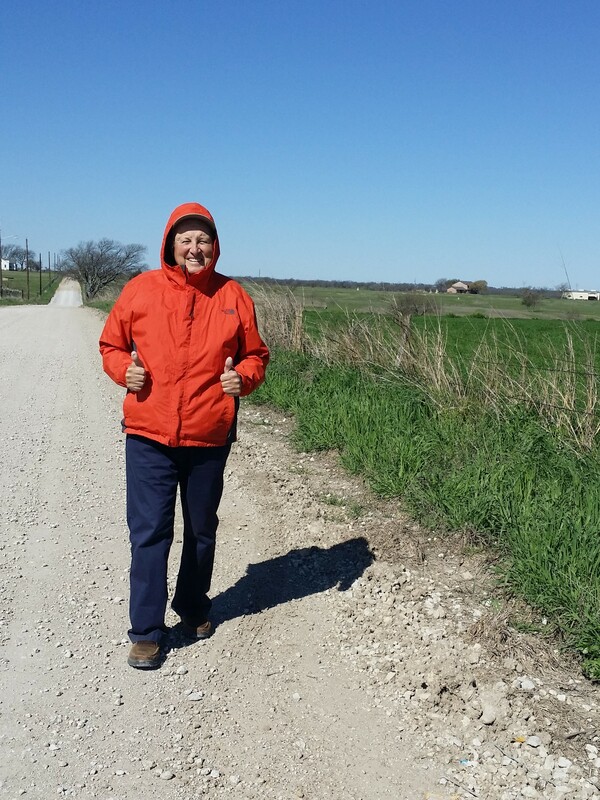 Braving the cold wind to take his first mile-long walk since his surgeries. He’s feeling much stronger and gaining energy day by day. Cardiac rehab starts this Tuesday. It’s a 12-week program, three times a week, and he’ll be able to do it close to home at North Texas Medical Center in Gainesville. 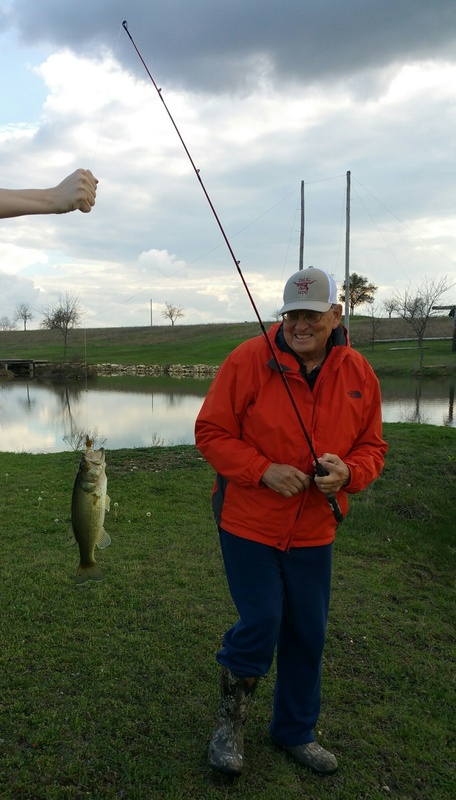 On Saturday Sophia drove Clem to the pond where he went fishing for the first time since the surgery and on his very first cast he caught a bass! 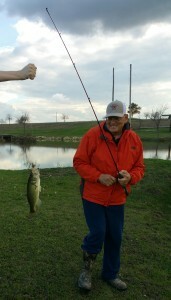 Then Pauline tried and didn’t catch anything! 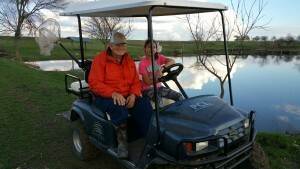 On Sunday he walked down to the pond, all the way around it and back to the house. 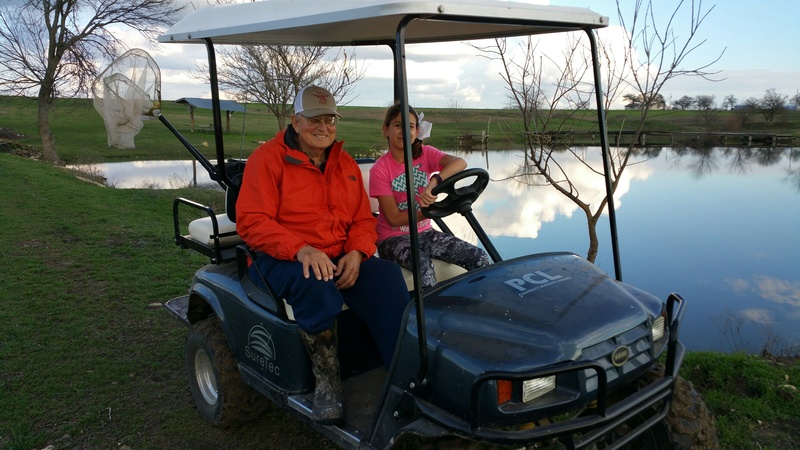 Clem went in for a heart checkup around the beginning of February and found out that a stress test from a year earlier had indicated a problem, but nobody had called him about it. 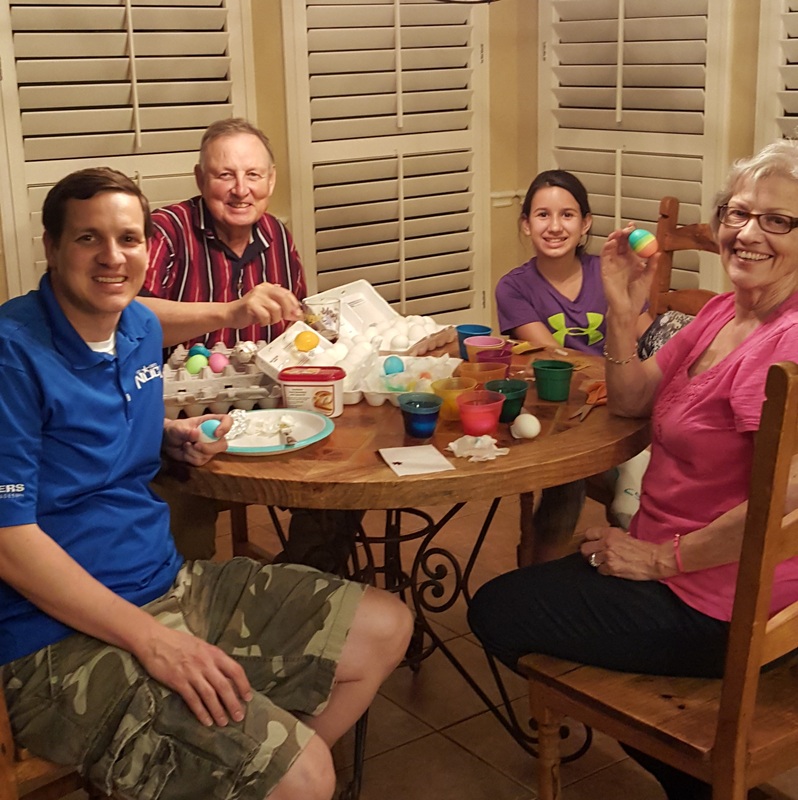 Very disappointing, but because of a caring daughter-in-law, Melissa, he decided to get an angiogram on February 17th and that showed that three of the four bypasses he had gotten in 2010 had severe blockage. Because Clem has a very busy schedule this summer with several vacations, one of which is to Russia to finally show Putin who is boss, he decided to hurry up and get the surgery done the following week. On Monday, February 22nd with the same doctor at the Heart Hospital Baylor Denton, across the street from where his 2010 surgery was performed, he was to receive almost a repeat of what he had gotten before, but this time with only three bypasses instead of four. It was expected that the surgery would last around four hours. Unfortunately for Clem there was significantly more scar tissue from the prior surgery than what was anticipated so the surgery lasted almost eight hours. Whoever was supposed to get into that surgery room next got bumped! After surgery they kept Clem sedated until the next morning. He was surprised that it was the next day, but very glad to have missed the first night of recovery. Over the next five days he was recovering well, but having such a difficult surgery had taken a toll on him so he was progressing more slowly than the first time. He finally was able to go home on the 27th and was doing well with each walk getting increasingly longer he was getting stronger with less pain. Then on Friday, March 4th Clem was not feeling well and only made it a short distance while walking before he was out of breath. He was concerned and so was my mom so they went back to the hospital. After a number of scans including a CAT scan, which by the way showed no cats inside of him, they determined that he had developed blood clots in his legs that had traveled to his lungs where they decided to make a home. Typically doctors use a special clot busting drug to remove the clots; however, since Clem’s surgery was so recent they could not do that. The risk of damage to the new bypasses and other work done was too great so they instead chose to just thin his blood to reduce the chance of further clots forming. Over the next few days his condition improved, but while he was being monitored they noticed some irregularities in his heart rate so he was given a souvenir pace maker just to be sure. We all love Clem and while he doesn’t want us all worrying about him sometimes it is good to let everybody know so he can get some prayers and well wishes!